They’re fresh. They’re easy to make. And they’re right at your fingertips. 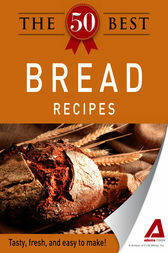 The 50 Best Bread Recipes is an appetizing selection of breads for you to bake right in your oven. From Crusty Italian Ciabatta to Cinnamon Swirl Sticky Buns, there’s plenty of options included so you can serve up tons of tasty loaves. Enjoy! They’re fresh. They’re easy to make. And they’re right at your fingertips. The 50 Best Bread Recipes is an appetizing selection of breads for you to bake right in your oven. From Crusty Italian Ciabatta to Cinnamon Swirl Sticky Buns, there’s plenty of options included so you can serve up tons of tasty loaves. Enjoy!